Sign up to hear the latest Naim news. Our latest network players have been engineered on the basis of a completely new streaming system. Three years in the making, this innovative, Naim-designed digital technology surpasses anything we’ve done before. Combining state-of-the-art DSP with a rich, analogue soul, our network players deliver engaging, immersive sound quality to get the very best out of your music, whilst retaining Naim's classic styling. The range includes the ND5 XS 2, NDX 2 and ND 555 – the first network player in the Naim 500 Series and the only one to match its power and audiophile-quality sound. Naim’s new network players offer numerous ways to listen to your music with clarity and precision. Stream audio from hundreds of supported smartphone or tablet apps such as Deezer, Qobuz, Plex, TuneIn, Soundcloud and Pandora with up to 24 bits/96 kHz resolution. Pair your Bluetooth device and instantly play back your music in high definition with the best Bluetooth on offer today (low latency). Explore thousands of internet radio stations from across the world and save your favourites as presets for easy access. Play music from a USB-connected phone, iOS device, other MP3 players, USB sticks or HDDs. Play music from multiple Naim streaming sources at the same time. Simply link, for example, the ND 555 in your main system to the Uniti in your office and the Mu-so in your kitchen using the intuitive Naim app. Our new network players benefit from everything we’ve learned over the last four decades. From our state-of-the-art streaming module to powerful, natural-sounding audio stages – our design DNA runs through each model in the range and helps to give it that distinctive Naim sound. The ND 555 development process also helped us step foot into new technologies: for the first time, we’ve added low-voltage differential signalling (LVDS) to a premium Naim player. We chose LVDS for its high-definition audio output, which offers faster processing and very low power consumption. With our new network players, we wanted to retain a classic look while integrating our latest technology and innovative new features. All of the models in the range use the familiar brushed metal exterior, while NDX 2 and ND 555 also include a 5” front-panel TFT display. 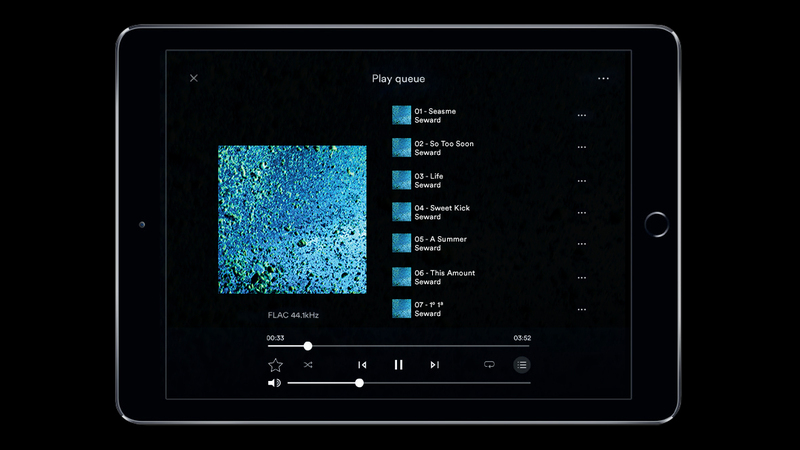 Along with the Naim app, it’s the face of our seamless new streaming system, providing access to streaming services such as Spotify and TIDAL, internet radio, local sources and album artwork – in short, ultimate connectivity. NDX 2 and ND 555 are supplied with their own Zigbee® remote controls. They remove the need for line of sight, so you can take control whatever direction you’re facing or even from around the corner. You can also use the same remote for different Naim streamers – a new device can be paired in a matter of seconds. Both the ND 555 and NDX 2 also feature 5” TFT colour displays with proximity sensors, as well as four control buttons for added flexibility and streamlined usability. The Naim App gives you effortless control over your network player: access all your music including radio stations, streaming services, and explore artist discographies and biographies. Convenient over-the-air software updates make it easy to add new functions at the touch of a button.